WSIU-TV’s River Region Evening Edition has aired about twice as long as many of its student anchors have been alive. If Republican Gov. Bruce Rauner’s proposed budget passes, the nearly 50-year-old nightly newscast’s days could be numbered. Judy Marshall, SIU’s executive director for finance, sent a memo asking all non-academic units, such as WSIU which houses River Region and WSIU radio station, to submit ramifications of a 50 percent cut in state funding by Friday. 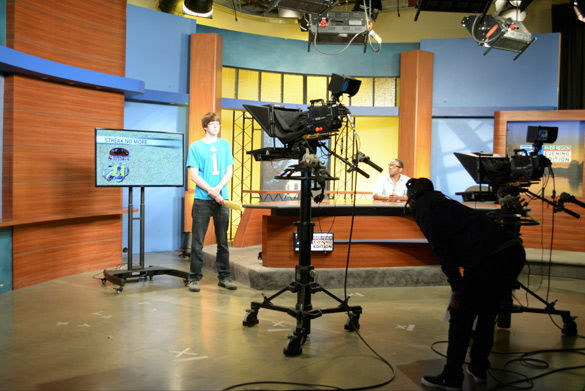 The university has requested the projection from the College of Mass Communication and Media Arts, which houses WSIU, as well as other departments in reaction to Rauner’s nearly 32 percent cut in state appropriations for public universities. The cut would result in a loss of more than half a million dollars for the broadcast station, said Greg Petrowich, executive director of WSIU public broadcasting. Petrowich said state funding makes up about 30 percent of WSIU’s total budget. While an original email sent from Dafna Lemish, dean of MCMA, stated that the fiscal year 2016 spending for WSIU is projected at $488,691, Petrowich said the number is higher. He said the total loss would be closer to $537,000. Lemish said she is concerned about the figures but a loss of this magnitude it is not a certainty. The university’s Executive Planning and Budget Committee will review all of the proposed cuts on Monday. “We weren’t given the instruction to cut, we were just given the order to present a scenario of what it would look like if we had to cut,” she said. President Randy Dunn said in a newsletter sent Wednesday the types of cuts that are a product of Rauner’s proposal will undermine many of the university’s goals. He wrote that developing the state’s budget is a long process but the university has to look for ways to mitigate the state’s financial crisis. “You can expect to see continuing evidence in the coming weeks of the types of cuts that are on the docket for all of SIU’s operations in every location if we can’t mitigate the drastic reductions proposed in the governor’s budget,” he wrote. Lemish said WSIU’s funding is being considered because when Dunn outlined the universities’ necessities, relating it to an onion, the station was on the outer edge, along with other non-academic units. The dean said this loss of funding would make WSIU an extension of PBS instead of a localized station, that incorporates PBS programming. Petrowich said while the projections are preliminary and nothing has been set in stone, a cut of this magnitude would cripple the station. Some of the preliminary cuts could be more than 100 student jobs within River Region and WSIU radio, saving the station more than $200,000. The executive director also said student-produced programs such as Scholastic Hi-Q and Expressions would also be among the first to go. Petrowich said the station could save money by ending its agreement with PBS, which costs $815,000 annually, and NPR, which cost $170,000 annually. He said cutting these agreements would be a mistake because the station would lose donations from listeners and viewers who enjoy these popular programs. This is because WSIU’s revenue is dependent on its services and most popular programs. He added that the cycle would only continue to hurt WSIU, which reaches 3 million people in five states. Lemish said even though programs like River Region are not technically academic, the experience they give students is unlike any other in Illinois. Jeff Williams, WSIU radio manager, agreed, saying the radio station provides about 3,500 hours of professional student training each year. While all other public universities offer similar opportunities to again experience outside of the classroom in radio and television stations, Petrowich believes SIU gives students a better chance at getting hired. He said he is not sure of all the services other schools offer but SIU graduates leave with a portfolio and the skills to work immediately, as opposed to other alumni who may need on-the-job training. Williams said if student radio and television programs were cut, he estimates that as many as 150 students could leave the university. Greg Todd, news director of River Region Evening Edition, said losing this training could hurt SIU’s enrollment moving forward. He said any cut in funding, especially a 50 percent loss in state money, would greatly reduce the overall education radio and television students receive. Lemish said it is hard to quantify exactly how many students become a Saluki for WSIU’s work experience, but she could see a dip in enrollment if the vocational opportunities are eliminated. Students said programs like River Region attracted them to the university and they may not have came if it was eliminated. Carlos Rodriguez, a sophomore from Oak Lawn studying radio/television, said he fell in love with SIU because of the chance to get involved with news production. Courtney Bunting, a senior from Carmi studying radio/television, does weather forecasts for WSIU and said she knows students who come from Chicago for these hands-on programs. She said the professional-style clips of published news stories and weather forecasts are a huge draw for many students. University spokeswoman Rae Goldsmith wrote in an email that about 25 offices were asked to make similar “what if” projections but she would not specify which ones. Goldsmith said more information could be available after Monday’s budget committee meeting.